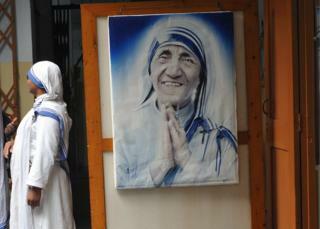 India is investigating Mother Teresa’s Missionaries of Charity amid allegations that it has been selling babies. The government has asked officials to inspect the charity’s centres across India. The order came after a nun and an employee were arrested earlier this month for allegedly selling a baby in the eastern state of Jharkhand. The charity called the news “shocking” and said it had begun investigating. India has a thriving market for illegal adoption, especially since adoption laws were tightened in 2015. India’s women and child welfare department said in a statement on Tuesday that it had “instructed the states to get childcare homes run by Missionaries of Charity all over the country inspected immediately”. Police arrested the two accused on 5 July after Jharkhand’s Child Welfare Committee registered a complaint that the infant was missing from the centre’s home for unmarried pregnant women. The baby, according to the police, had allegedly been sold to a couple who believed they were paying for the mother’s hospital expenses. The charity had said the incident was “against our moral conviction”. “We will take all necessary precautions that it never happens again, if it has happened,” Sunita Kumar of the Missionaries of Charity told the BBC. Nobel-laureate Mother Teresa, who died in 1997, founded the Missionaries of Charity in 1950. The sisterhood, headquartered in the eastern city of Kolkata (formerly Calcutta), also runs hospices, soup kitchens, schools, leper colonies and homes for abandoned children.